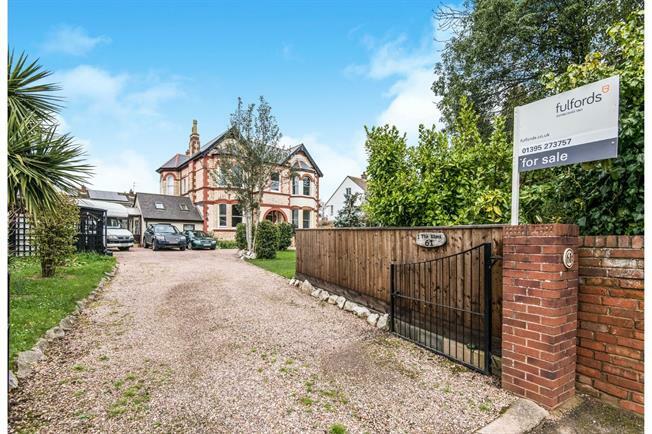 5 Bedroom Semi Detached House For Sale in Exmouth for Asking Price £625,000. OPEN HOUSE WEEKEND 27th AND 28th APRIL. TO BOOK YOUR VIEWING PLEASE CALL FULFORDS ON 01395 273757. An extremely spacious five bedroom semi detached Victorian house which offers very flexible accommodation. The property, which is set back from the road, is approached by a long gravelled driveway and retains many period features internally and overall comprises of two/three reception rooms, conservatory, kitchen, utility, large garage and double car port, garden/sun room, large lawned garden to the front with a further lawned walled garden to the rear. Internal viewing is highly recommended to appreciate the accommodation on offer. A large hallway with a wide staircase, cornicing and picture rail. Having a Victorian style coal effect gas fire and bay window to the front. A useful and versatile room accessed from the living room and in turn giving access to the conservatory. Double doors leading to the rear garden. With a cast iron open fire to the chimney breast and ceiling rose. With low level WC, wash hand basin and shower cubicle. A double bedroom with wash hand basin and bay window to the rear. A double bedroom with wash hand basin. A large single/small double bedroom with some sea views. A large double bedroom with bay window and wash hand basin. The front double bedroom with shower cubicle, twin wash hand basins and bay window to the front with sea views. A larger than standard garage with power and lighting.